The Medion Akoya P6625 provides fantastic all-round power and portability at a great price, meaning those on a slightly tighter budget should look no further here. Despite costing £210 less than the Lenovo ThinkPad L412, this laptop provides increased performance. The Intel Core i5 430M processor is joined by 4096MB of memory, and makes remarkably quick work of running everything from web browsers to music editing software. Along with the Hyper-Threading and Turbo Boost, this excellent performance is made possible by Intel's Smart Cache technology. The Core i5 processor family boasts an impressive 3MB of cache, allowing the processor to keep working data closer to hand and increase performance, without having to always access the standard memory (RAM). 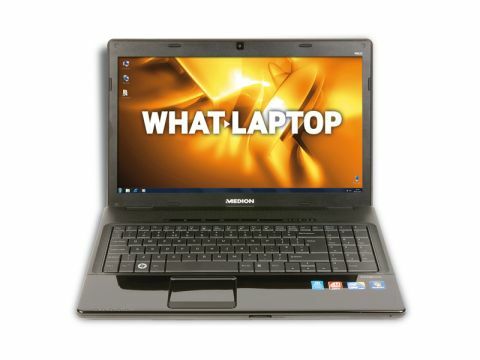 The laptop also features switchable graphics and, at the touch of a hotkey above the keyboard, you can choose to run either a resource-light integrated Intel or power-hungry dedicated ATi GPU. The former will give you maximum battery life - a solid 228-minutes - but poor graphical performance, while the latter provides the sort of power usually associated with a gaming machine, but battery life drops to 150 minutes. This gives you the flexibility to choose between portability or very impressive multimedia performance. The 15.5-inch screen also impressed immensely and provides great colour vibrancy, making it great for multimedia use and watching movies. The chassis is built from a matt-black plastic with a shiny palmrest. It's a little uninspiring and the palmrest very quickly attracts smudges and smears, but ultimately works well enough. The keyboard is comfortable with a light – if a little spongy – action that will suit those who regularly type up documents, and there's also a dedicated numeric keypad included for those who regularly work with spreadsheets. 802.11n Wi-Fi and Gigabit Ethernet are included and allow you to network at the fastest speeds currently available. Along with HDMI for connecting to external high-definition (HD) sources, such as your HDTV, an eSATA interface is also included and will suit those who want to regularly back up data to compatible external hard drives at impressively high speeds. All in all, we were extremely impressed by the Akoya P6625. The performance on offer – both everyday and especially graphical – is truly exceptional for the price, while the screen and general usability also impress.